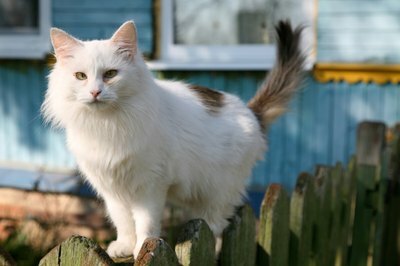 Outdoor cats are more likely to get worms than indoor kitties. Roundworms and tapeworms are among the creepier pests that your cat can acquire. These two parasites have a lot in common, but their anatomy, health risk and transmission are quite different. Keep in mind that you can get roundworms from your cat, but you can't catch tapeworms directly from him. Roundworms are the most common parasite that haunts the feline digestive tract, occurring in up to 75 percent of kittens, according to Cornell University College of Veterinary Medicine. Tapeworms are also found throughout North America, but their need of fleas as intermediate hosts prevents them from spreading as quickly as roundworms. Both worms drain resources from your cat by latching onto the walls of his digestive tract. Diarrhea and constipation are both indicators of a roundworm infection, but tapeworms rarely cause noticeable symptoms. Roundworms have more freedom than tapeworms. Your cat can get roundworms by eating eggs when hunting prey or by grooming an infested cat. Kittens can also get them from nursing. The only way you or your cat can get tapeworms is by accidentally eating a flea, according to VCA Animal Hospitals. This is a minor risk for adults, but children may accidentally swallow one while playing on the floor. Cats may swallow fleas if they lick one up while cleaning their fur. Controlling tapeworms is as easy as keeping fleas off your cat. Roundworms are thin and can grow up to 5 inches long. Their movement and proportions are similar to those of an earthworm. Tapeworms are a little more modular. They are longer than roundworms, with an average maximum length of 8 inches, according to VCA Animal Hospitals. Their body is segmented into dozens of tiny pods. Each segment contains eggs that are released when the pod detaches from the main body and is passed through your pet's intestines. Your vet may request a stool sample to diagnose your cat's worm problem. Since tapeworm segments are visible to the naked eye, an infestation is easier to spot than a case of roundworms. There are several prescription medications that can treat roundworms, including products containing febantel and piperazine, according to Mar Vista Animal Medical Center. While tapeworms are resistant to some dewormers, the ingredient anthelmintic is effective against them. Ask your vet before giving your pet any additional or different medication than the ones he prescribed.